Susan Heim on Writing: Exclusive Excerpt from "Tournament of Chance," by S.G. Rogers! Exclusive Excerpt from "Tournament of Chance," by S.G. Rogers! 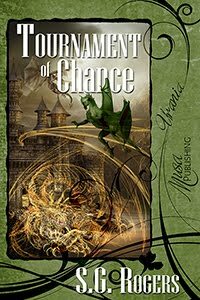 Susan Heim on Writing is pleased to be a stop on the Tournament of Chance Book Tour. Read on for an exclusive excerpt from this exciting book by S.G. Rogers! A loud insistent pounding at the front door startled Heather awake the next morning. A few moments later, she heard Ustin having a row with her father in the kitchen. Heather’s mother, still clad in a dressing gown, stepped into the bedchamber. She held a lantern aloft. The author is giving away a $25 Amazon gift card! CLICK HERE to enter! Thanks for hosting me on your blog, Susan!